For those of you following along at home, I did finish my Amazing Technicolor Dream CYOA on Friday, exactly two weeks after casting on, and I am thrilled with it. True to form, I completely neglected to take pictures of it over the weekend, so hopefully there'll be some sun after work this week so I don't have to wait until next weekend to get photos. Since then, I've picked up my SSKAL Wainthropp again, and I've started the bottom ribbing. 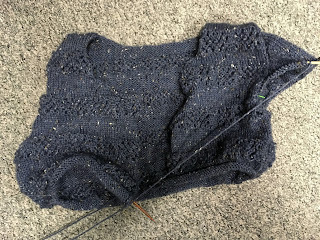 I originally thought I'd have enough yarn for elbow-length sleeves, but it's starting to look much closer than that. I'm pretty sure I'll need to order another ball of yarn, which means I'll probably miss the KAL deadline, but these things happen. I'm super excited for this sweater, and I'm so glad I decided to jump into this KAL, so it's still a win for me. For a brief moment last night, my Amazing Technicolor Dream CYOA wasn't on the needles. I finished the second sleeve, and it was, for all appearances, done. Clearly, that's not the case anymore. 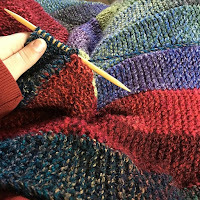 As I was nearing the end of the second sleeve yesterday, I considered how much yarn I had left, and I decided that I wanted to extend the body by another two inches. 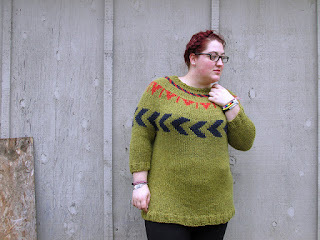 My plan for this top was to have a slightly polished sweatshirt kind of look, and I'd really like it to be more hip length since I still have yarn left. It can be difficult to be so close to being finished with something and decide to rip back part, but I'm really going to like the extra length more. Don't get me wrong-I would have worn it with the shorter body, and I'm sure I would have loved it, but since I still have yarn, why short change myself? We're in the middle of a snowstorm right now, which makes knitting and watching murder shows sound more appealing than anything else. Yesterday I went home sick, which made Mystic happy, and then later on I managed to very gracefully fall on my bum after brushing the car off (this is about as far into winter as I've ever managed without falling). It's still snowing, but it's slowed down quite a bit, and hopefully town will be back to normal soon. I've been working steadily on my Amazing Technicolor Dream CYOA, and I have the first sleeve done and a good start on the second. I've got it in my head to wear this to an audition this weekend, so hopefully I'll be able to bang it out in the next couple days. 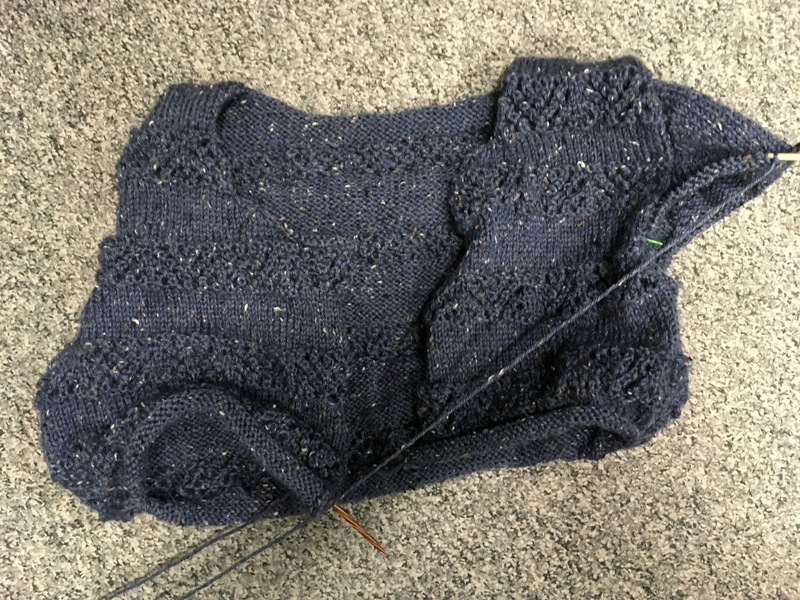 It's coming along exactly as I imagined so far-I'm knitting this one smaller than my cropped version for a more fitted look, and I'm doing three-quarter length tapered sleeves. With any luck, I'll have a new top this week (and my first FO of 2017!). What a weekend! I'm sure it was very full for many of you as well. My Saturday was pretty much taken up with my town's sister march-we had over 500 marchers in my little town, and over 3,000 more in the city an hour north of us. I was exhausted afterward and ended up needing a three hour nap, but it was worth it to see people of all ages and backgrounds come together. I don't really have words for how it felt to see so many people come together. Nearly every one of my blog and Instagram friends were at some kind of march over the weekend, and I feel so grateful to be a part of such an active and passionate community. It's been humbling and awe-inspiring to see the numbers and the pictures from marches all over the world, and I feel truly grateful to have been a part of it. This is only the beginning, though, and the organizers for my town are already working on the next steps. Today is a difficult day for me. I don't know what the next four years are going to bring, and I don't know what the world is going to look like at the end of them. I'm scared. I'm holding on to our community here. I'm holding on to beauty, and creating, and making my voice heard. I'm holding onto the goodness and generosity I see in people, I'm holding onto my friends. Today I'll cry. Tomorrow I'll march. And after that, I'll keep staying informed and making my voice heard. I believe that We the People can hold our government accountable. And I believe that all of us can make the world kinder and more generous. Give freely. Love deeply. Remember that none of us are alone. My Wainthropp is a bit of a tangle right now, which is making it difficult to carry around. I'm still using this as my lunch knitting, but it takes a few more minutes for me to get it all sorted to start working on. 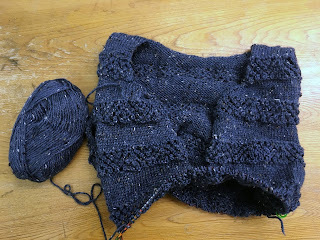 I'm about a repeat away from the body ribbing as written, but I want to see if I can squeeze in another inch or so. Therefore I've started a sleeve while the body stitches are all still live and attached to their own ball. I'm almost done the sleeve cap shaping on this first sleeve. I'm not doing full length sleeves on this one-I'm planning for the sleeves to be just over elbow-length. I originally planned to do both sleeves, then finish the body, but now I'm thinking it'll be much easier to finish the first sleeve, weigh the remnants from the sleeve ball, and set enough yarn for the second sleeve aside while I finish the body. That'll split up sleeve island a bit and make this whole project a bit easier to carry around. 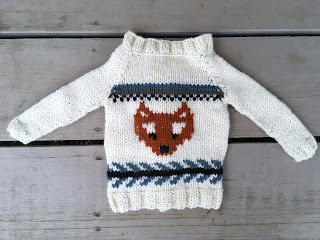 This KAL goes through February 14, so I'm not too worried about running out of time. 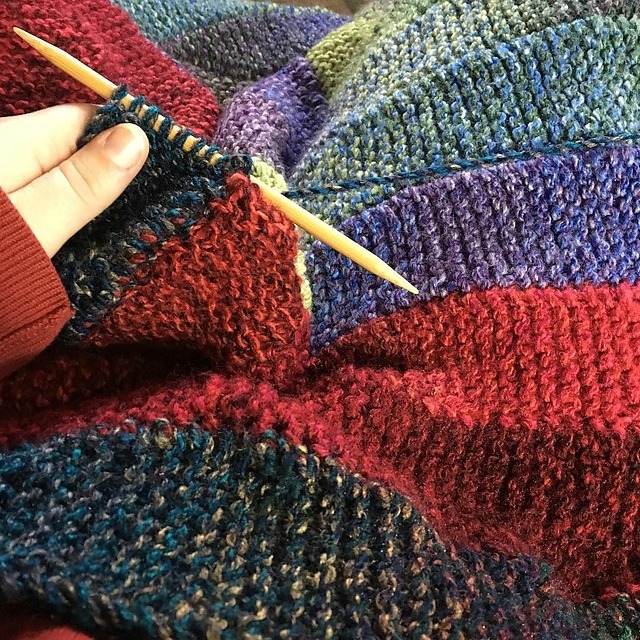 I'm really loving how this is coming together, and I'm excited to get it finished so I can start some other sweaters I have planned for this year. Since I've discovered that I really like KALs, I decided to jump in on the Selfish Sweater KAL from Untangling Knots. 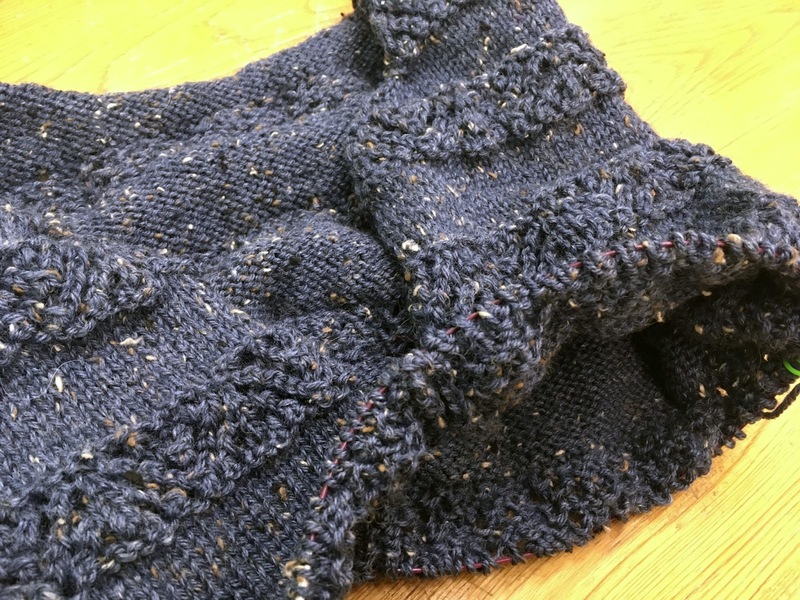 I've done one of Andi's KALs before, back in 2014 (the Marion KAL), and while I struggled with the social aspect of it, I've long admired Andi's patterns, and I've always been happy with the ones I've knit, so I figured why not. I had six balls of Knit Picks Wool of the Andes Tweed in my stash-this is pretty deep stash, and I have no clue what I was planning when I bought these, but I decided they'd be perfect for Wainthropp, and so far I'm thrilled with how it's knitting up. Hopefully I'll be done with the body soon, and then it'll just be me on sleeve island. I don't have buttons for this sweater yet, but I have to run to the city at the end of the month and I'm planning to hit the yarn store while I'm up there and hopefully I'll be able to snag something perfect then. The KAL goes through February 14, so there's still time to jump in on the action if you'd like! 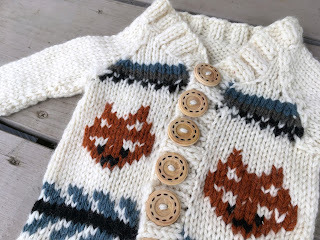 There are a lot of awesome knitters in the group, I'm having a blast watching everyone's cardigans come together! Today's the last day of the Early Check-In KAL, so I thought it would be the perfect time to share my last FO of 2016! 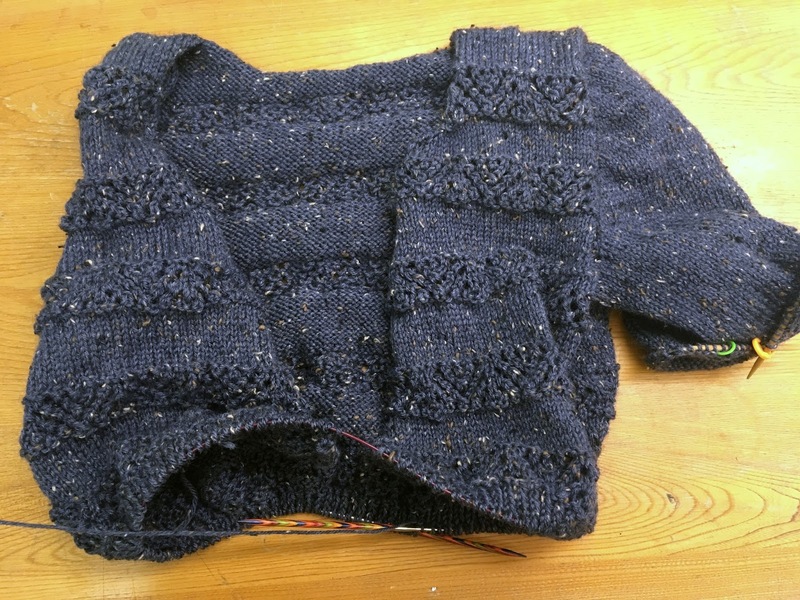 I hadn't intended to finish this sweater before the new year, but at 11:40pm on December 31 I wove in my last end. 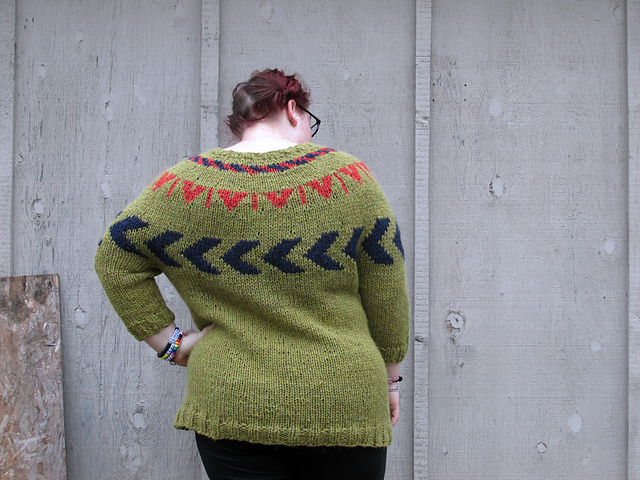 As usual, I had a ton of fun with this KAL, and I absolutely love this sweater. Love love love. 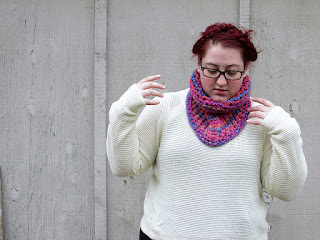 I did a pretty drastic yarn substitution with this project, using two strands of Kenzie together. Because of that, my sweater isn't as light and lofty as the sample-it's still lofty, and not as dense as I feared it might be, but it's definitely a substantial sweater. 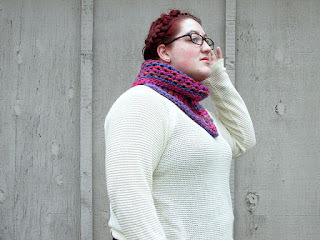 I didn't really make any mods to this-I knit the size 48 so I'd get 4-5 inches of positive ease, and I only knit three-quarter sleeves, because I loved the look of the pushed up sleeves in the pattern photos, but I didn't want the bulk of a full sleeve. I also knit the collar a little shorter than called for, because I have a problem with things too close to my neck. I'm absolutely thrilled with how everything came out, and I wouldn't change a thing. 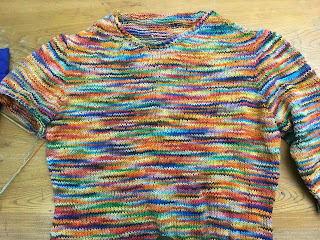 I definitely went with "1970s appliance colors," which are the best colors, in my opinion, and I've already worn my finished sweater quite a bit. 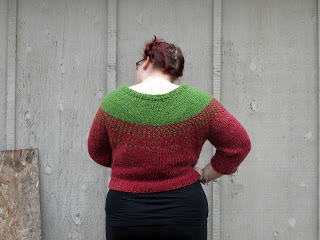 I love the deep yoke so much-between this and my xmas sweater, I want deep yoked everything now! 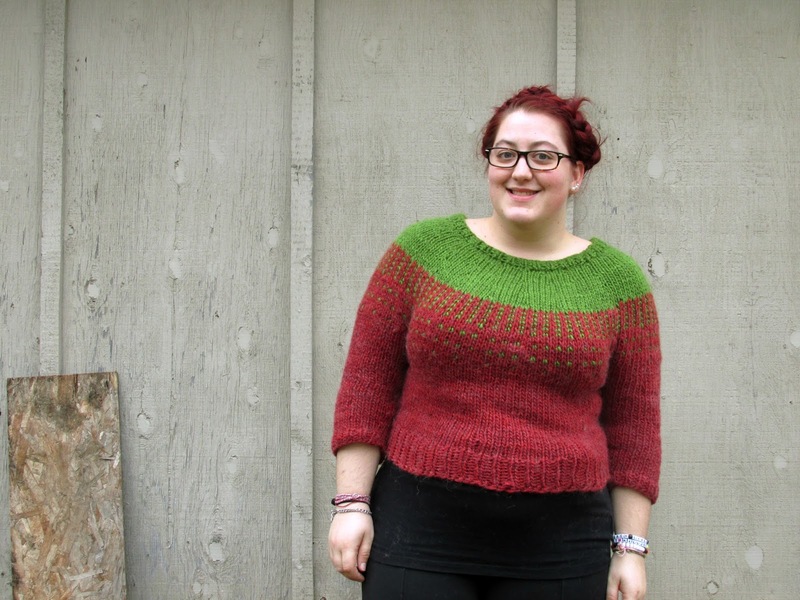 Yarn: HiKoo by skacel Kenzie "Kiwifruit," "Bayberry," and "Oceania"
I fell in love with Chiral way back in March 2015 when Cory knit the first prototype of it (yeah, another one of Cory's patterns). The pattern was finally ready in June 2016, and I immediately began keeping my eye out for the perfect yarn. This yarn was one of my scores from the holiday bazaar, and as soon as I saw it I knew it had to be Chiral. Guys, this yarn is my everything. It's got all the colors I want my hair to be, if I ever felt confident and secure enough in my employment (and had enough cash) to dye it beyond plain red. It's absolutely delightful, and I am thrilled to bits with how it knit up. 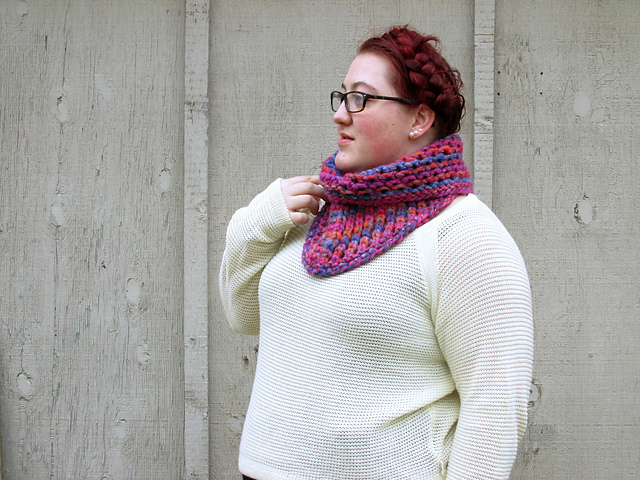 This is such a great, interesting little cowl, it knit up in no time at all, and I'm so excited to have my own little conceptual, origami, shawl-collared cowl. It's perfect. Yarn: Plymouth Yarn Marley "5 Kaleidescope"
I only knit three xmas gifts this year, and while that's certainly a cut back from other years, I was still frantically knitting up through December 23. My cousin's baby got the Reindeer Pullover, which is still one of the most charming things I've ever knit, but I also knit for my mum and for one of my best friends' toddler. My friend is super into foxes, and as soon as the Fox Hills Toddler Cardi was published, I knew I had to make it for little Cas. I mean, it's freaking adorable. 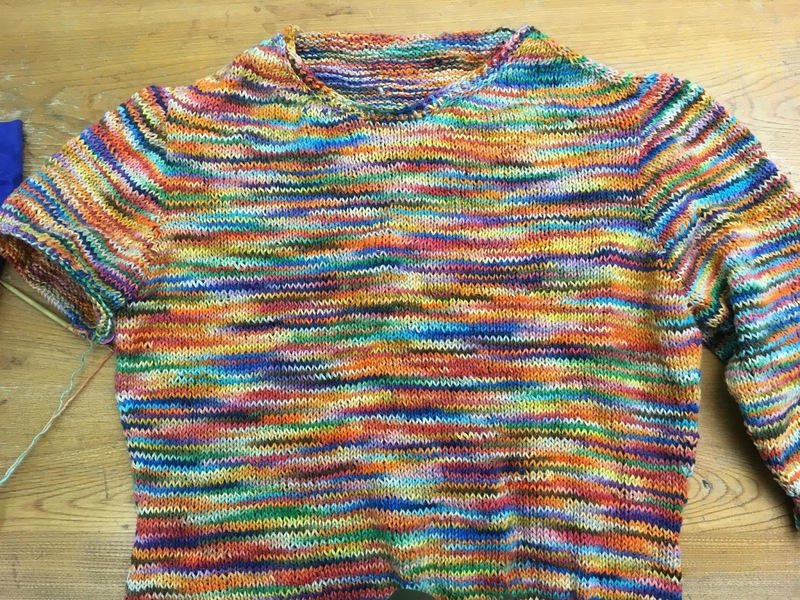 This was so much fun to knit, but I did make a couple of mods: 1) I knit the body in one piece to the underarms, instead of knitting three pieces separate, to cut down on seaming, 2) I knit the sleeves two at a time again, and I eliminated the colorwork on the sleeves. 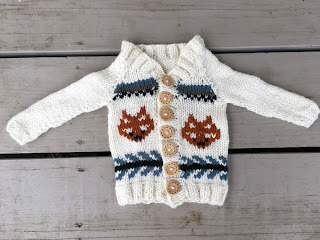 I didn't think the sweater necessarily needed it, and Cas has grabby little toddler fingers, and I don't want my friend to have to deal with getting him untangled from sleeve floats all winter, 3) I picked up stitches and knit the button band onto the sweater instead of knitting it separate and seaming. Life's too short for that nonsense. This was my first time actually doing duplicate stitch, but I've been familiar with the technique for a while, and it is one of the most satisfying things ever. I did mess up in a couple of spots and have to fix them, and I ran out of yarn with just two stitches left one time and had to cut another piece, but overall I'm absolutely thrilled with how this came out. All my fingers and toes are crossed that it actually fits its intended recipient. 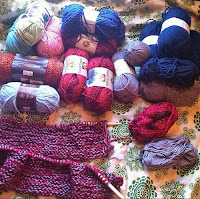 Yarn: Knit Picks Wool of the Andes Bulky "Bare," "Cadet," "Wallaby," "Coal," and "Masala"
Finally, I knit for my mum! 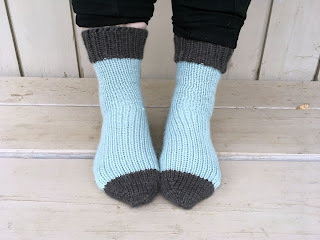 She has a big collection of thick fuzzy socks to wear around the house, but I've only ever knit her regular socks, so this year I decided to knit up a pair of Foot Ovens. These were so enjoyable to knit up, they're super quick and gratifying, and they're really warm. And so soft. 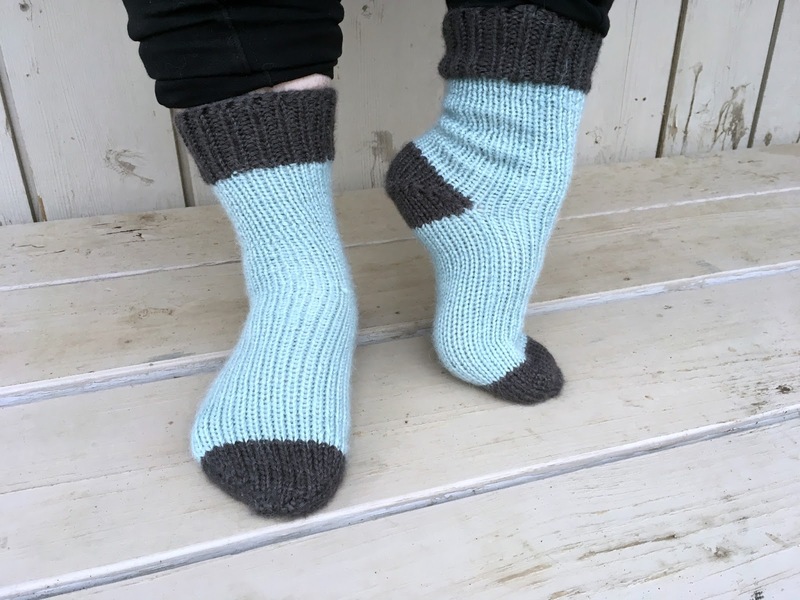 I'm not normally a toe-up sock lover, but I managed to get these ones the right size, and my mum is super excited about them. Yarn: Misty Alpaca Chunky "Light Blue" and "Charcoal"
Happy New Year! I have a bunch of stuff from 2016 to blog still, so this week is going to be a bit of a catch-up. 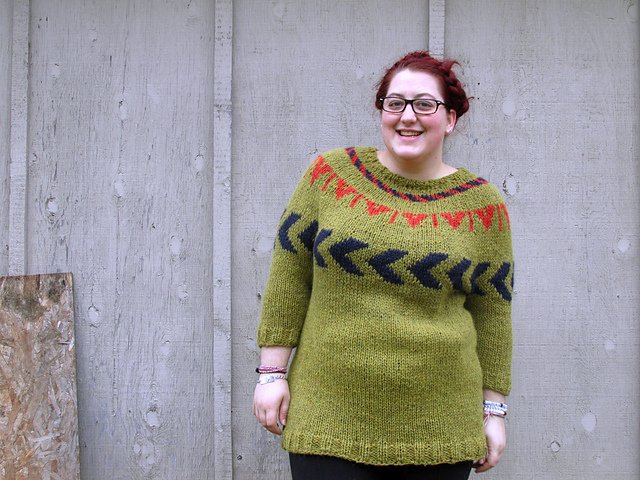 First, we have not one, but TWO sweaters that got done in December! The first is my mum's Sweatshirt Sweater, which ended up giving me a bit of grief, but I'm so proud with how it came out! I ended up being almost exactly 100g short of yarn, and it took a couple weeks for me to line up more. I'm so pleased with how this came out-the sleeves are nice and long for maximum sweater paws, the pocket is nice and cozy, and the collar isn't too close to the neck. I'm really hoping my mum loves it (but there's also a part of my that hopes she doesn't so I can have it). Either way, it's a fantastic sweater, was a great knit, and it'll keep my momma nice and cozy for years to come. 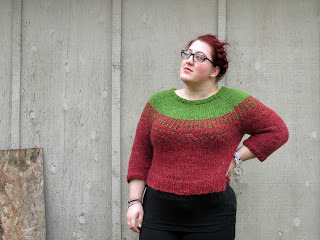 Up next is my very own Xmas Sweater! 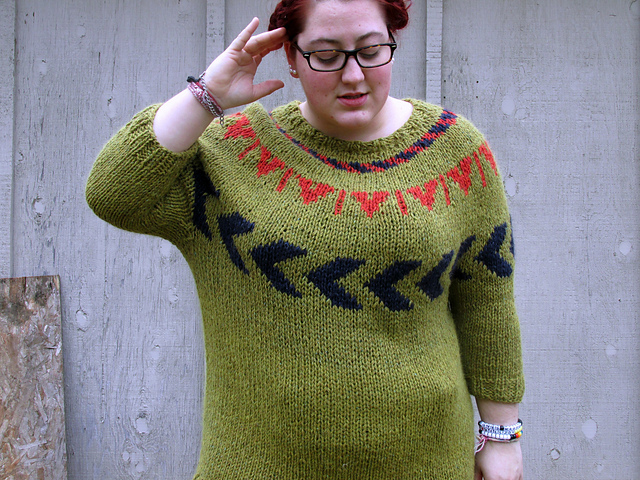 I'm so pleased with how this came out, and I'm looking forward to wearing it for many winters. This project was totally yarn-driven; for those of you that don't remember, I got this yarn at the Holiday Bazaar, and there were just three skeins of the red and one of the green. 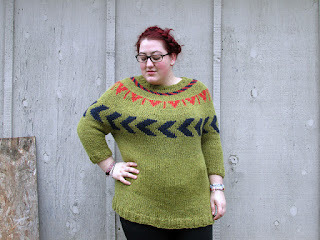 I knew I wanted a green yoke, with some colorwork interest before the red body. Since I had such a limited amount of yarn, I knew I needed to knit from the top down, and I knew I wanted a circular yoke. I stole the numbers from Leah's Filled With Secrets pattern and set to work. Stranded colorwork eats up yarn, and I knew I needed to make mine stretch, so I chose to incorporate interest with slipped stitches instead-that way, I only used one color per row, and I got these cute little green dashes coming down from the yoke. I'm really happy with how it looks! 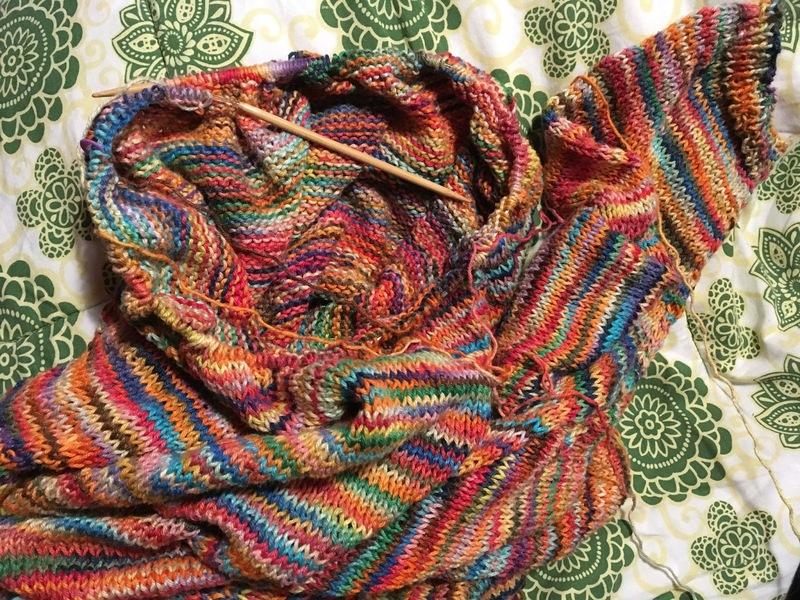 Once I had the body and sleeves divided, I took one skein to do the sleeves, weighing to make sure each one took just under half the skein. Fortunately that made the sleeves my preferred length, and I used every last inch of the remaining yarn on the body to get it as long as possible. 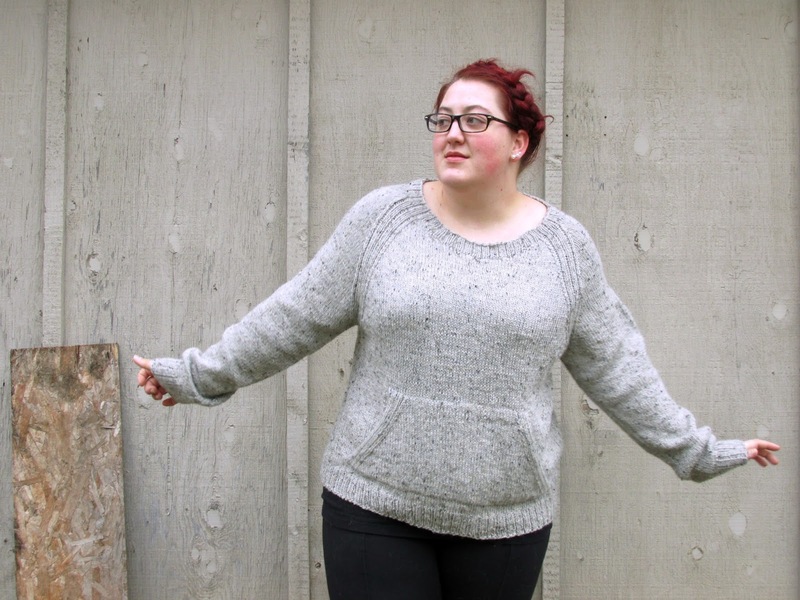 The result is this slightly cropped pullover, with a comfy yoke and three-quarter sleeves. It's long enough to wear with midrise jeans and short enough to tuck into a skirt without adding too much bulk, and I love it. 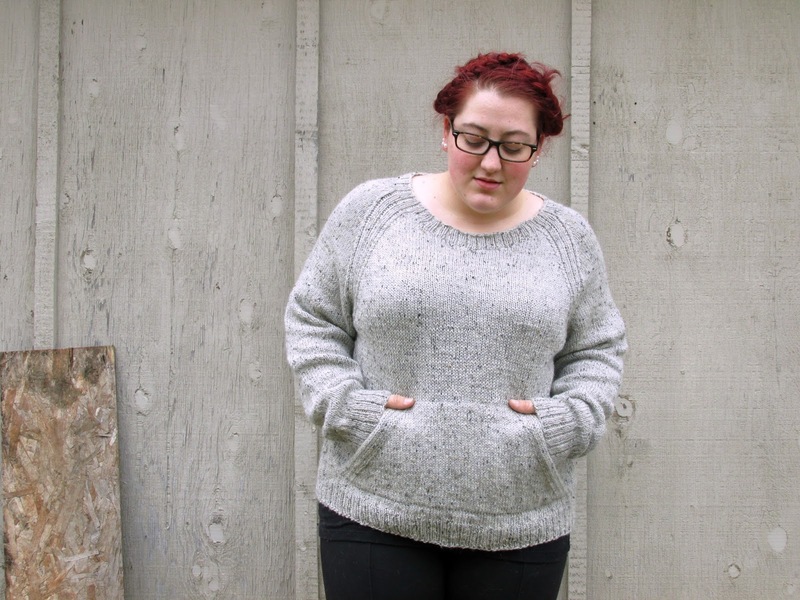 It came out exactly as I imagined, and it's already one of my favorite cozy around the house sweaters. Yarn: Brown Sheep Lamb's Pride Bulky "191 M Kiwi" and "181 M Prairie Fire"